Firstly boil some water in a pot. Once hot, quickly pour in the oats and crack the eggs. Stir like crazy until the eggs are cooked. Lastly, sprinkle some salt (if you prefer a salty taste) or sugar (if you like sweet). 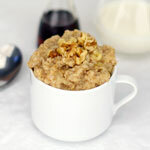 Some people may include milk to make the oats become thicker and more full. Give it a try and I hope you like it. It's been tried many times and tested with good results. 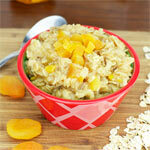 Oatmeal becomes more fluffy with increased volume when eggs are stirred frantically into the cooking oats. 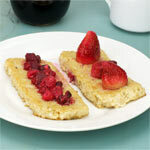 Mr Breakfast would like to thank paulinecheong for this recipe. 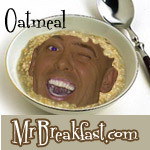 What do you think of Eggy Oats? How much water is needed. Can anybody say how much they used to get the right consistency? How are we supposed to know how much water to use? This is basically a useless recipe. Any idea how many calories that will make? Thanks for the recipe. Can't get enough! Yummy!